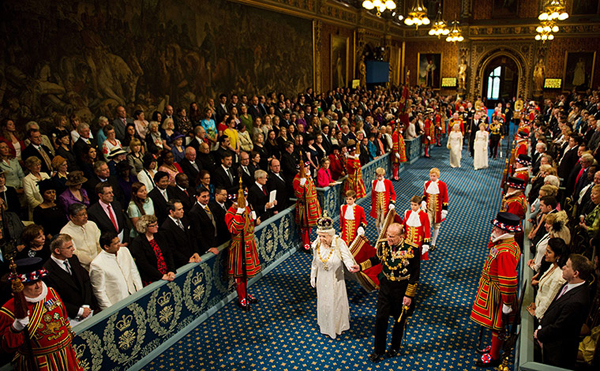 Yesterday was Europe Day and the State Opening of the Westminster Parliament. I note from today’s Independent that one to those to raise this conjunction was the eurosceptic, pro-demo cracy, Tory MP Douglas Carswell. Just occasionally I agree with him – though please don’t panic – seldom on Europe. However, despite all the pomp, pageantry and majesty of yesterday’s home performance, he was right to point out that very likely the largest percentage of our new laws and regulation over the next year will have their origin in the EU. Of course, and according to the Independent he was likewise ‘appalled’ by the appearance of a European flag somewhere along the processional route. Symbols are important, but what about the substance? Surely having made the factual observation about the genesis of our new laws, the next obvious thing to do would be to indulge in some transparent, joined-up thinking about the process by which these laws sneak into our national statute book. Just to blame the EU institutions which contain Brits at almost every key decision making table is hardly constructive. Why not for instance think about properly combining the two events or at least having two separate national ones? In this sense a day when the European Commission President, or one of the Vice Presidents, attends before the Westminster Parliament to lay out the Commission’s Work Programme for the year. To be carried out not in historical fancy dress but in normal office attire. Such presentation to be followed by a open debate in the Commons with the Commission President and Ministers, parliamentarians and yes, to include for the day our MEPs. This all done in the full glare of our national media. Might such an event not have told us more about what is in store for the next year than yesterday’s shopping list affair. Instead the Queen has to more or less studiously ignore the impact of the EU and our engagement or otherwise with it. It remains something ‘other’ of which we cannot properly acknowledge. By way of example let’s take one instance from yesterday’s London list. The reform of libel law, an issue on which there is now broad consensus. Most look forward to when our courts do not carry the tag of being ‘the libel capital’ or the centre for ‘libel tourism’ yet even these descriptions should warn us that we do not operate in a national vacuum. Yet where is the acknowledgment or sense that this is very much a part of a wider European legal framework? This from the need for both legislator and judges to balance the competing rights of freedom of speech and personal or family rights under the European Convention, to the impact of the E-Commerce Directive on Internet publication and the patchwork of rules of private international law that still govern this area. These policy areas should not be entered without some sense of a European ‘vision’ or at least European ‘context’. It maybe that a European solution in terms of actual European law or regulation will be rejected but surely this should not be done without full and fair debate of all the consequences. There were many who commented with regret on what looks likely to be the failure of Lords reform in the coming year, but I can’t help thinking that the way we approach our national law-making could do with a much deeper overhaul to match contemporary circumstances. So I may not be so bothered about what flags we fly but I am bothered about being able to see how our laws are made and where they come from! In this we could help ourselves.